The rise of the always-on, always-connected consumer will continue to redefine how marketers plan for digital advertising in 2014, according to a report by eMarketer. Delivering immediacy will require a real-time approach, that brings with it both benefits and challenges. 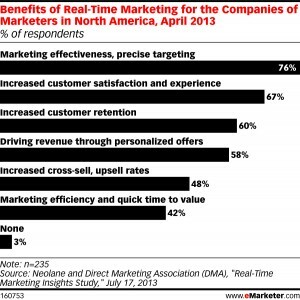 In a recent survey by Neolane and the Direct Marketing Association of mid/executive-level marketers, 78% state that real-time marketing increases effectiveness and allows for precise targeting, while 67% agree that it increases customer satisfaction. 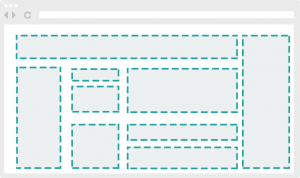 Responsiveness is also being augmented through the integration of digital channels. SEO, display ads and social media are now becoming more connected with websites, email and search. This means consistency and real-time updates across channels other than Facebook and Twitter. This means real-time display ads. Real-Time Display eMarketer touts digital display ads as a tool that "help marketers establish a presence with consumers across the purchase cycle", but also states that delivering immediacy will require both automation and smarter data. Programmatic advertising (automated buying and selling of digital ads) has definitely helped speed us along. 2013 was the year for programmatic ads. 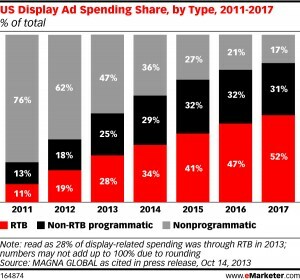 In 2014, forecaster MAGNA GLOBAL predicts real-time bidding will grow more than 38%, and by 2017 RTB will represent over half of all US digital display spending. While we now have ad inventory at our fingertips, we still need to put something in those ads. The problem is that digital ad workflow is based on the traditional 'big strategy-design-develop-launch-measure' methodology. The average turnaround on a digital ad campaign is 52 days. We don't have six weeks to develop a display ad campaign folks. Unless marketers accelerate messaging, they risk losing their audience. I can get a Twitter campaign up and running in a couple days, or a few hours if I have messaging and assets. Marketers need to able to do that with a rich-media ad campaign. We already have technology and tools that make this possible. We need the workflow to follow. Will 2014 be the year we do Superbowl Oreos and Mini UK Horses with display ads? Here at Adventive, we think so, and we've built a platform to support it.